HOH room. Tyler and JC. Tyler – did that sound alright? JC – yeah that was really good acting. Everyone thinks Haleigh is the target now. Tyler- smiles. JC – that was smart because if he wins then you don’t have him after you. Tyler – I know that’s exactly what I did. JC – good job! You’re learning. Finally. Tyler – I really like Scottie. It f**king s**ks. JC – I like him too. But he has never had any loyalty to us at all and he is a really good player. He has a good social game. 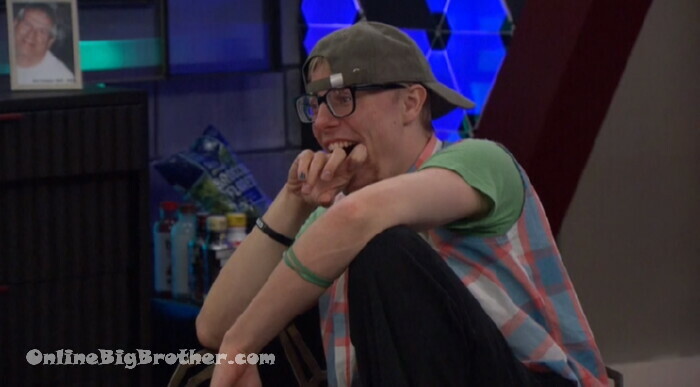 When Angela was HOH I really though he was going to come to our side. And then he took all the info to those people I like Fes.